"When we looked at her for the first time, we were worried. She was so tiny but her stomach was so swollen. Her eyes and skin were yellow. I held her in my arms only a week after her birth. We thought the jaundice had subsided, but within days, she started itching all over her body. I didn't know how to stop it. The itching is so severe that her whole body now has scratches. Only a liver transplant will relieve her from this pain and trauma." - Mahalakshmi, Diyashree's mother. Little Diyasree is in excruciating pain from her birth. She can't walk on her own yet, and when her little fingers grab her mother's to try and stand up, she falls back, defeated. All she can do is cry, but sometimes, she cries so much that she stops breathing. 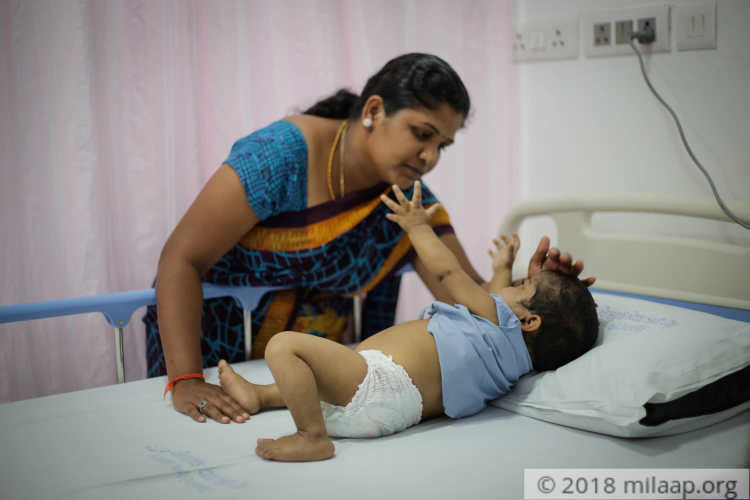 "She had a lot of medicines and injections but nothing reduced the swelling. We took her to a hospital in Chennai and only then we found about her liver disease. She cries so much and so loudly that within a few minutes, she faints. There are times when I fear to even touch her because her whole body has rashes. "- Mahalakshmi. 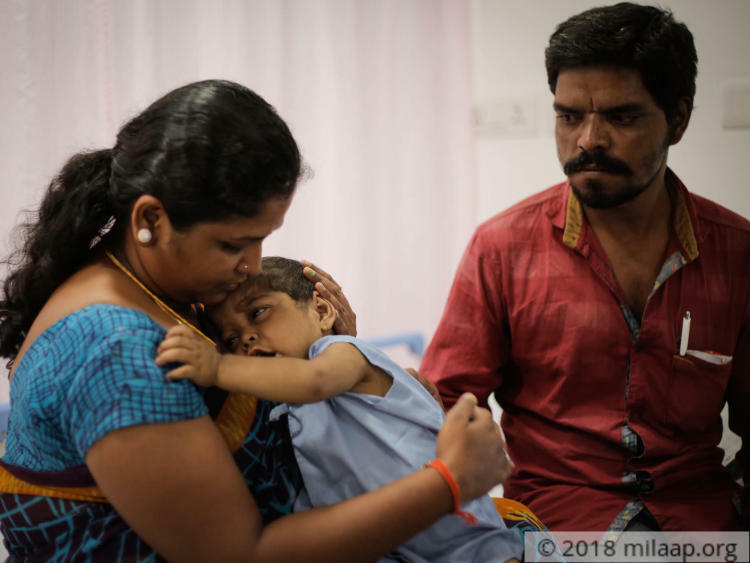 By the time Mahalakshmi and Jai Kumar took Diya to a hospital in Chennai, her condition had become worse. A biopsy was done and the results confirmed her liver ailment. 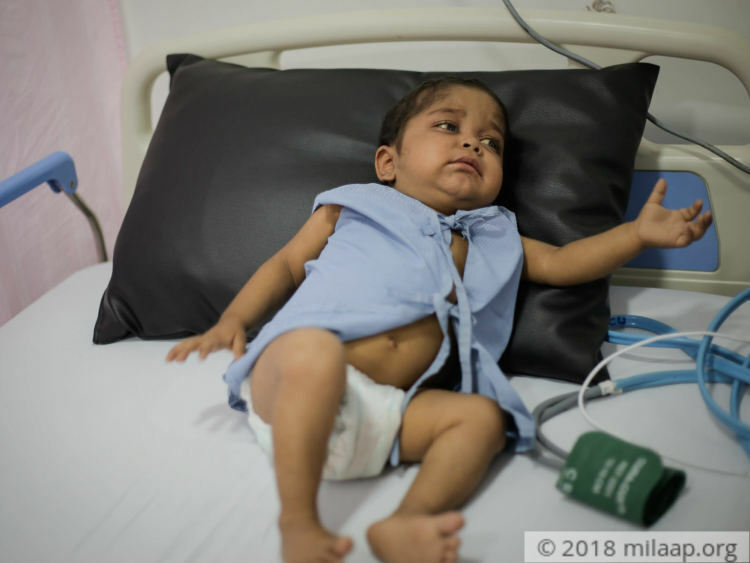 Doctors said that her liver is completely damaged and she needs a liver transplant at the earliest. Medicines have reduced her itching to some extent, but it is not enough. Only a liver transplant can put an end to all her pain. "I don't know where I went wrong, I took immense care during my pregnancy. Despite all the difficulties, I made sure she had nutritious food. Now, even a small infection, fever or cold can be dangerous. Each passing minute seems like an hour. I'm scared that I might lose her at any moment." - Mahalakshmi. Diya's family stays in Coimbatore. They took her all the way to Chennai for her treatment. Their 4-year-old daughter, Bhuva Shree, is at their relative's place. Jai Kumar has been working day and night. He spends sleepless nights not knowing how to arrange money for the transplant. His family and friends are helping him, but there's only so much they can do.
" I have already borrowed 1.5 lakhs for the treatment, now I do not know whom to turn to for help. I feel I have failed her as a father. I'm willing to do anything for my daughter, and all I wish is a normal and peaceful life for her." - Jai Kumar. 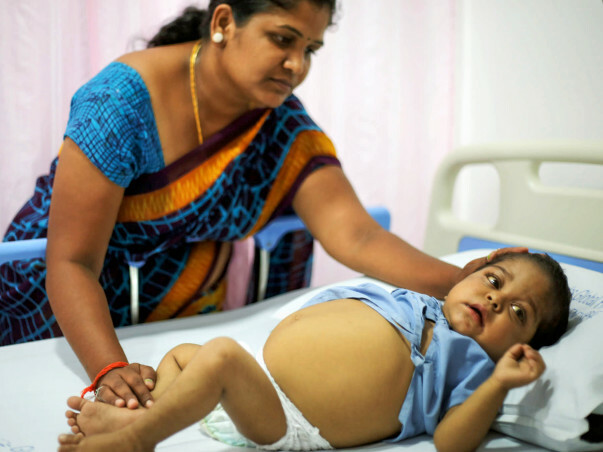 1-year-old Diyasree has been suffering from a serious liver disease since birth. She has unbearable pain and itching. Only a liver transplant can save her life. She has very little time without it. Her parents have exhausted everything that they had and are now helpless. With a meagre income of Rs 6000 per month, her father has no means to afford 20 lakhs for the transplant. Only your support can save her life. Diyashree was doing well, she was on medication as prescribed by the doctors. Doctors were of the opinion that she could be treated with the medicines. She was responding well to the treatment and all of sudden her health deteriorated and she fainted. She was taken to the hospital, but by the time the family could reach the hospital, it was too late. 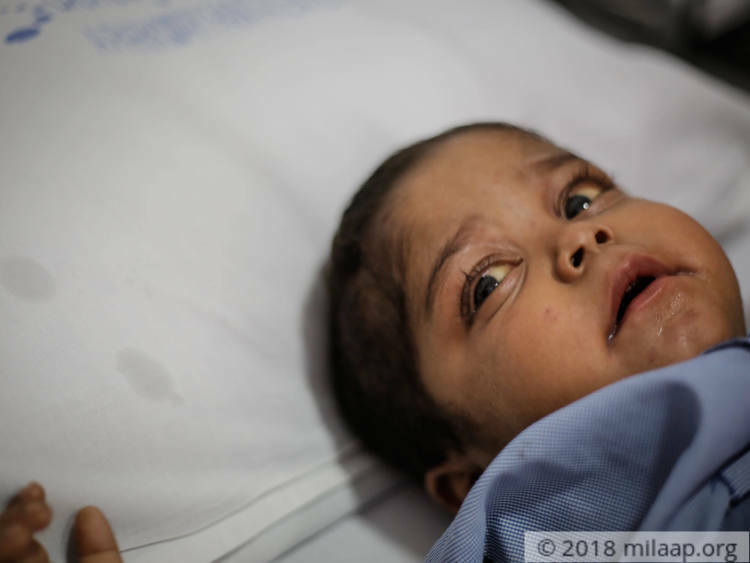 Doctors tried their best to revive her but could not save her. The family is in deep grief with their loss. May her soul rest in peace. Since, the funds could not be utilized for the intended purpose. 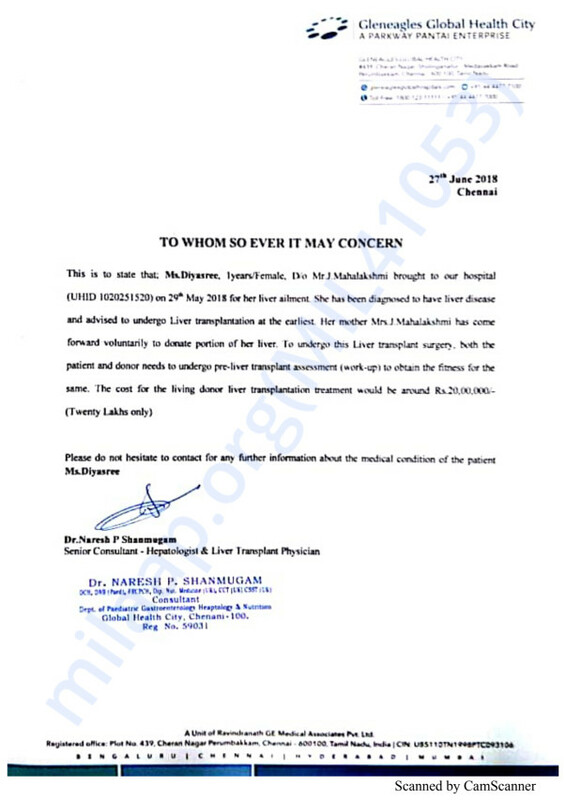 We would like to inform you that there is a patient named Jaya Surya who needs urgent funds to undergo Liver Transplant at the earliest. As per the discussion with the family, funds will be mapped towards Jaya Surya's campaign. We do understand that some of you may like a refund since the original purpose was not met. - 100% of your contribution will be refunded - please reply to us by 3rd October if you would like a refund for your contribution. Thank you for the wonderful support that you have shown towards my daughter. She is doing better now compared to earlier and she is undergoing ayurvedic treatment at present and will take about a month until the results show. Her mother is a match and she will be donating a part of her liver to our daughter. The doctors will be able to suggest the date of the transplant procedure after her weight has increased.